In December I went to our the city art museum to look at their permant collection - we had only been to special exhibitions for years. 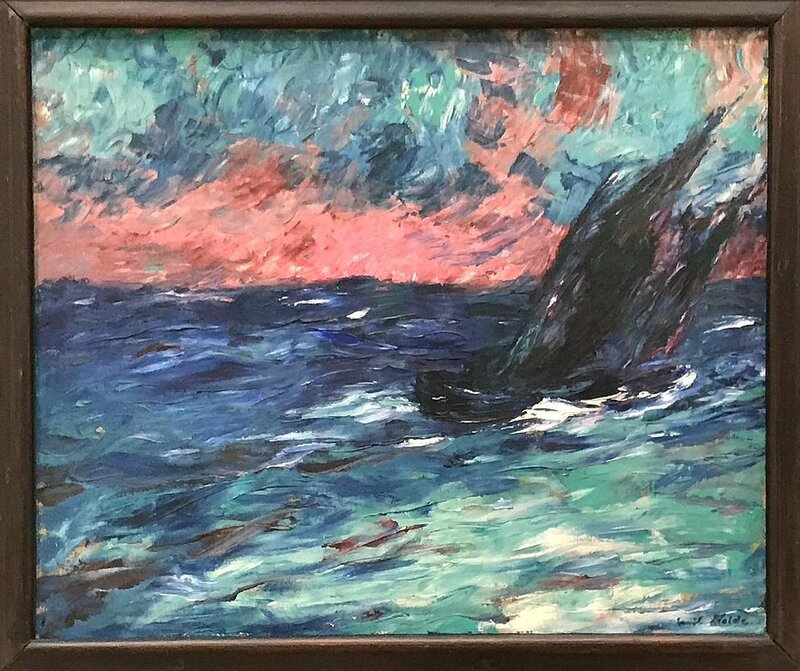 I came across a painting by Emil Nolde, whose paintings I really like, and it was just the right colourway! It is called 'sailboats in the wind'. Neutral colour will definitely be navy. As second colour either grey or denim... Accents could be seagreen/teal, rose, burgundy, white, light blue. I am not sure, which fabrics I will use - I will work my way along. 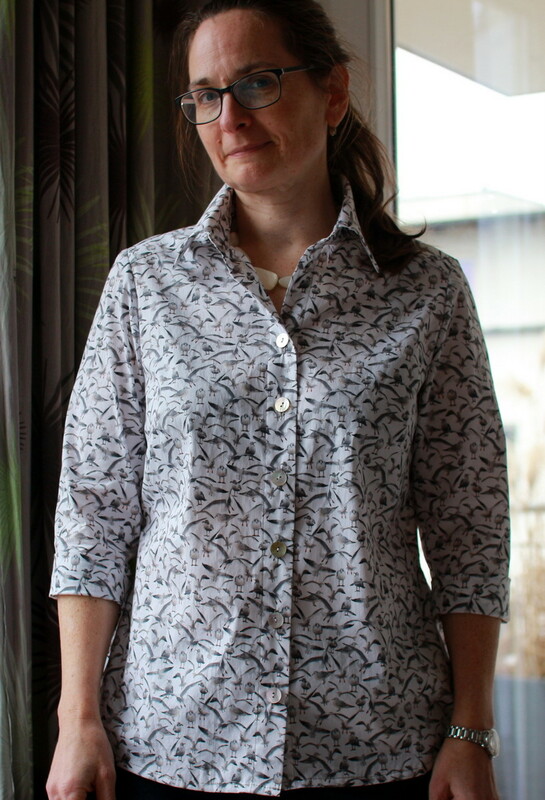 So I plunged into sewing as I got a bit of time... TNT shirt pattern and a stretch cotton fabric that I LOVE! And it fits not only into the colour palette of above picture, but to the theme... I tried out a new cuff - folded up with a V-slit. I really like that one, will use it again on my TNT. I also finished a cami - no picture yet. The pattern is the Odgen Cami by True bias. Nice pattern, only a bit full at the hem, I sized that down. 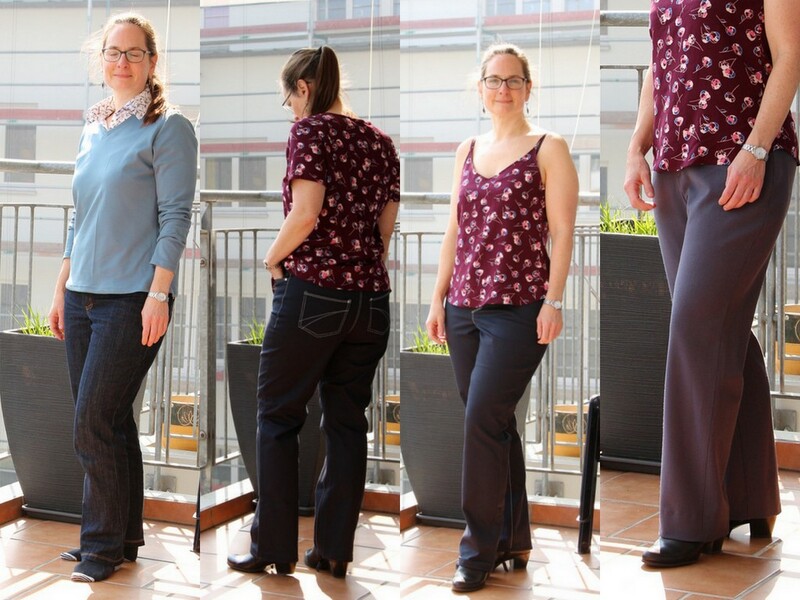 I finished a dark blue Morris Blazer, another pair of jeans in dark blue, and two tops of the same viscose fabric in burgundy. I made a camisole (a modified odgen top) and a simple top/blouse with sleeves (modified pendrell blouse. The Pendrell is sleeveless, but I drafted sleeves for it a few years back). While I am touring Europe, working, a quick photo of my new Morris Blazer. Made from a beautiful wool knit crepe I bought at Moods. Simple TNTs are great if you need to sew something quickly. 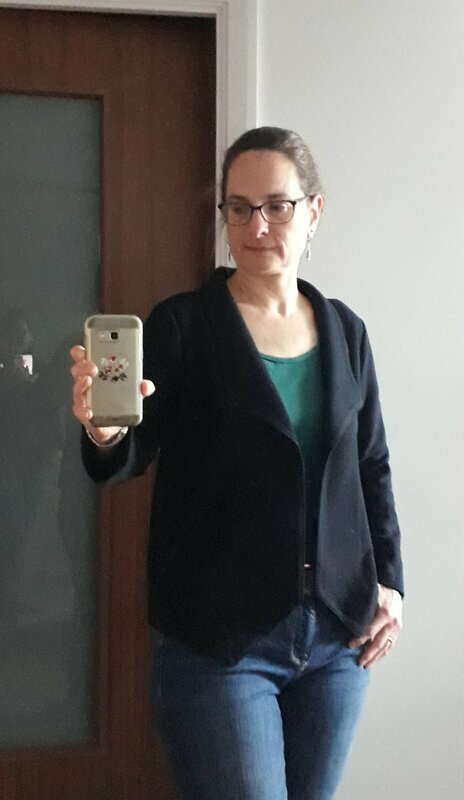 So I pulled out my TNT pattern for sweaters (drafted for last years SWAP) and made up a garment in seagreen - as that colour is prominent in the inspiration picture and I happen to have a very nice wool knit fabric in stash. The cutting and sewing took me about as much time as finishing the v-neck - I used a new-to-me method from a book (Lynda Maynard, Dressmakers Handbook of couture sewing techniques) that was given to me by a friend of my mothers. I really like the finish - it is easy enough to sew (though I took time to do it as to do it well, as flaws will show) and looks great. So, maybe more v-necks in future... then I took the opportunity to get photos of the other garments I sewed these last weeks. The seagull shirt I showed already, as well as the denim jeans. I am afraid they are a bit short, but I wear them anyway as they are VERY comfortable. Same pattern, but strangely not as comfortable (though about the same amount of stretch) are the dark blue jeans. I got more fabric, maybe I'll try my other jeanspatter with it. 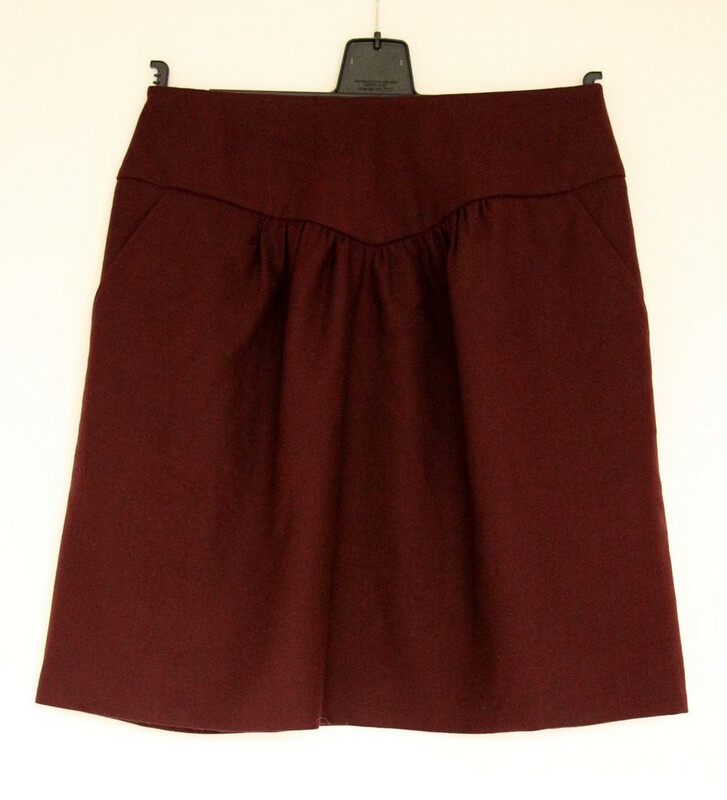 The burgundy pendrell blouse is wonderful - it also fits great with the burgundy skirt. I am not sure I will include the cami in my SWAP, but it is shown anyway. As is the grey woolcrepe pant. My daugther went on class trip today and is gone for the week - that gave me ample time to start another item this afternoon, which I finished just now. A few weeks ago I already tweaked my TNT blouse pattern to resemble the Fisher blouse from Silhouette patterns. I made a simple v neck instead of the neckline the Fisher blouse had. 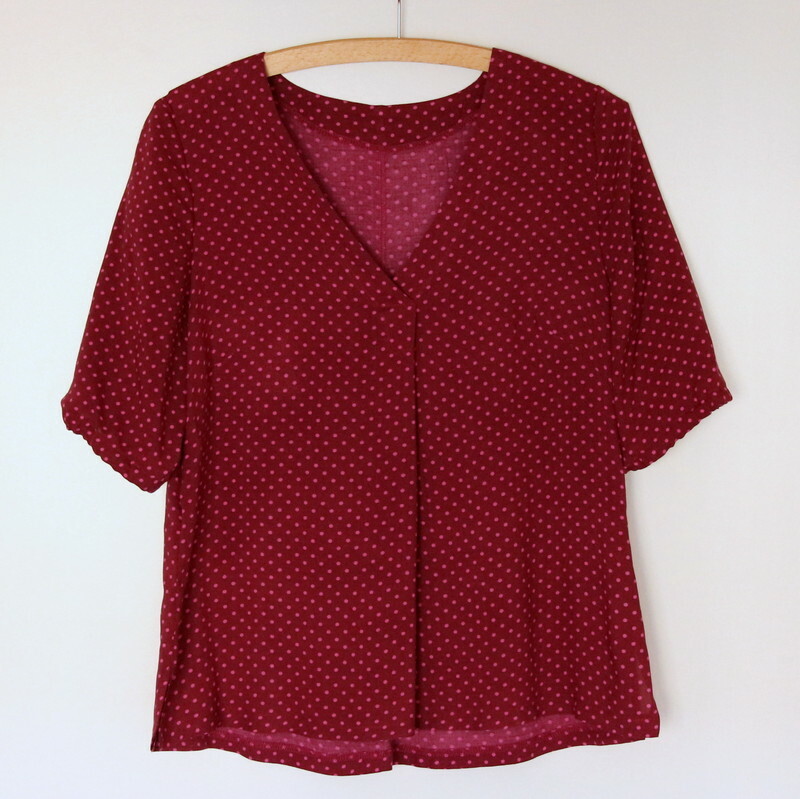 I sewed it up in burgundy coloured viscose, with ellbow length sleeves and like it alot! Although it is too long, so I have to shorten it tomorrow. Love the burgundy color, Eva. Great choice. Maybe make the longer and shorter versions? Somebody might prefer it a bit longer. Another item done - a poloshirt in navy. I morphed my TNT tshirt pattern with the poloshirt pattern from Silhouette patterns (#225). It certainly is wearable, and comfortable (well, it is my TNT), but I don't favour the collar. Too big. But - it looks very good paired with the seagreen sweater I sewed up last week. 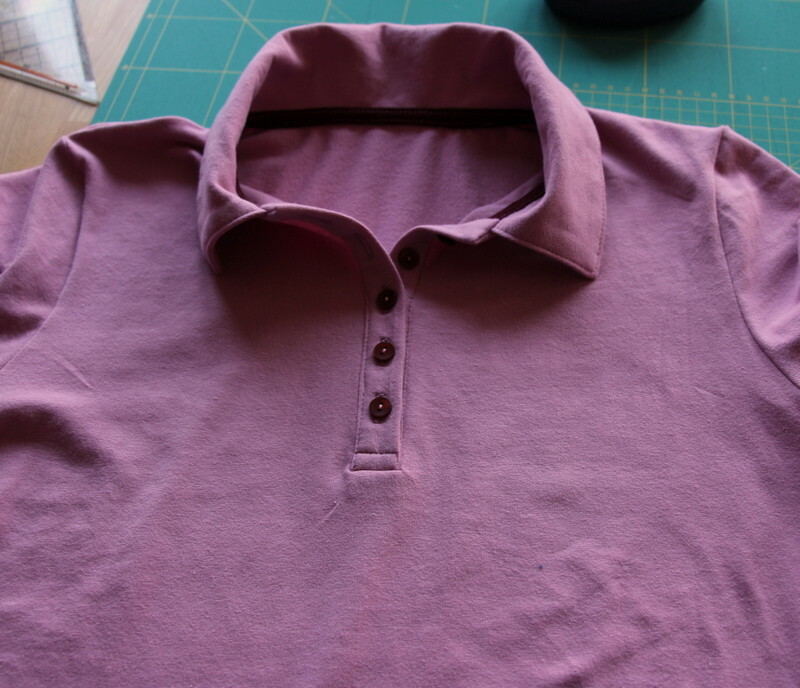 So I cut out the next poloshirt, in pink. With an altered neckline and a different collar construction. The neckline of the blue shirt was too open/wide for my taste (and the collar too big). 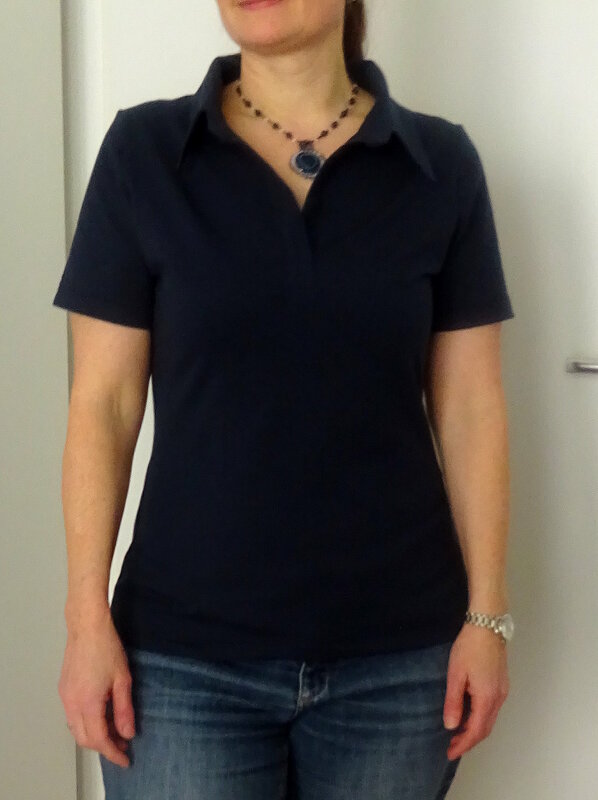 https://www.pattydoo.de/schnittmuster-poloshirt-kleid-leslie is much closer to the neck and altogether smaller. Tomorrow I'll know if this Mr.Potatoehead works. The 'Fisher blouse' from last week. Poloshirt with the collar from this pattern morphed on my TNT. Much better collar. There is a nice (german) video that shows the construction of the shirt. These are the colours of my SWAP, taken from the inspiration picture. Neutrals are burgundy and navy.